I have learned to love thunderstorms. They are exciting and something like a scary movie. We know it’s coming, we know it can be dangerous, we just don’t know exactly when or where the lightning will strike. We don’t know if we will suddenly be in complete darkness, temporarily blinded by a flash of electricity, or feel the vibration of thunder. It’s the expected unexpected that keeps us on edge. I’m not sure why I enjoy a good storm now. I remember a time when they scared me; many stormy nights I would wake up my husband and ask him if he thought we should take shelter. We lived five miles down a dirt road, thirty minutes to the nearest town, without any kind of tornado siren. One blustery night I woke him up for the umpteenth time and he patiently said, “It’s just a storm, go back to sleep….” his drowsy voice trailed off. “I know,” he said. “But it’s just a hard rain. Please don’t wake me up for every little storm.” He was immediately asleep. I lay awake for what seemed like hours, listening to the wind howl and the rain pound. When the hail hit, it sounded like handfuls of rocks being thrown at the window, I was sure the windows were going to shatter. By now the wind had escalated to the point that things were blowing past, large things, like lawn chairs and dog houses. Tornado! We quickly gathered our small children into the safest room we had. Outside the storm raged, we knew it was destructive, but it was too dark to see. We had to wait for daylight to look at the damage. It was obvious. 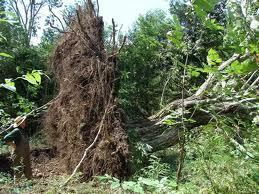 Seventy-five year old oak trees were completely uprooted and thrown around the yard. Their huge roots were higher than the house. Nobody could get out of their driveway, too many trees were down. We had to cut our way to the dirt road and then start clearing the driveways of the nearest houses. The tornado had gone between our house and my grandparent's house next door. My uncle was visiting from California. He was staying at my grandparent’s home. The tornado had taken a large branch and thrust it through the side of their house, like a giant’s dagger, into the bedroom where my uncle was sleeping. As soon as we cleared the driveway, he got in his truck and left for California and never came back to Arkansas! It was all very frightening at the time. Perhaps that's why storms remind me of scary movies; they start out small and benign, harmless. But then they build to a threatening climax and what happens next is a bit unpredictable, just like a good story with a twist....or in this case, a twister. I wrote this last night, before all the devastation in Oklahoma. One tornado can cause so much damage and heartache, they really are very scary. The first real tornado I saw was in Kansas in the 1970s.